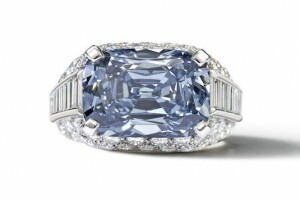 A rare fancy deep-blue coloured diamond weighing a massive 5.30 carats has sold at auction in London. Bidding came from around the world via 25 telephone lines as well as from numerous bidders in the packed salesroom, where the cushion-cut diamond sold for a record price of $10.8 million AUD. Set horizontally into the centre of a 1960s style ring, the beautiful blue diamond is surrounded by pave-set round colourless diamonds and courses of baguette-cut colourless diamonds into an 18 carat white gold mount. The term “fancy” is used to describe a diamond of unusually rich colour and value. Blue diamonds obtain their hue as a result of small atoms of boron mixing with carbon atoms which affects the absorption of light passing through the diamond, a rare but natural occurrence in the earth. 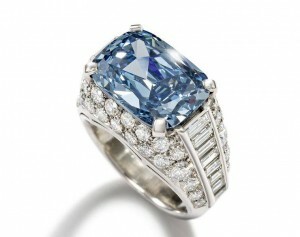 Blue diamonds are structurally very pure and account for less than one per cent of all diamonds mined.